One of the largest towns in Fiji, Nadi is a bustling multi-cultural hub in close proximity to Denarau Island, the Mamanucas, and Natadola Beach, which is famed as is Fiji’s most spectacular. When visiting the heart of the South Pacific, be sure to add a trip to Nadi to your itinerary. From your base at one of the many comfortable Nadi hotels available, visit the Sleeping Giant orchid gardens, enjoy the sunset at Nadi Beach, take some time out to relax at the Sabeto Hot Springs and Mud Pool, or experience an authentic taste of the local culture with an afternoon at Sri Siva Subramaniya – the largest Hindu temple in the Southern hemisphere. 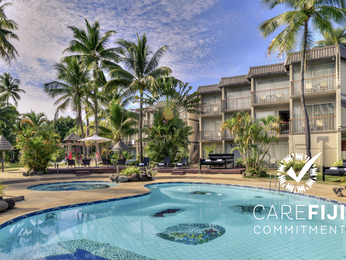 The ideal getaway for couples and families, Hotel Mercure Nadi offers the finest Nadi accommodation, set within five acres of lush tropical gardens, just minutes from the airport. Talk to our staff to book local tours and activities, or for the scoop on off-the-beaten-track attractions.